Western Galilee is the coastal strip of land which runs along the sandy Mediterranean coastline north of Haifa and up to Rosh Hanikra on the border with Lebanon. Old City of Akko (Acre) - Historic city with plenty to see. 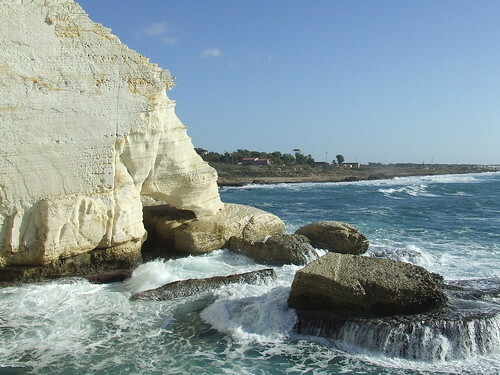 Rosh Hanikra - Magnificent limestone grottoes and other attractions. Nahariya - Nice seaside resort between Akko and Rosh Hanikra. Goren Park and Montfort Castle - great place for hiking and picnics. Follow route 4 from Haifa heading north until you reach East Akko junction and then turn left and follow the signs to the Old City. Rosh Hanikra is situated on the northernmost point of the West coast of Israel on the border with a Lebanon.The main attraction at the tourist site are the limestone grottoes which are accessible by a short, steep cable car ride. The white chalk cliffs that you see from the cable car are part of the Galilee mountain ridge and contain fossils of starfish and other ancient marine life. There is a light-and-sound show with translations in several languages including English. Find out how the grottoes were formed and learn about the train tunnel that was built there during the British Mandate for the railway that linked what was then Palestine with Lebanon. There's also a restaurant, a snack bar and a souvenir shop at the site. TIP! The rocks are wet and slippery so it's important to wear shoes with a non-slip sole. Trust me on this one - I know someone who went in Crocs and she slipped and broke her foot in several places! Just north of Nahariya. Continue on route 4 heading north - you can't miss it! All year round, 7 days a week (half day on holiday eves). In the summer, the intensity of the blue sea against the white rocks is breathtaking. In the winter, the waves are spectacular, but be prepared to get wet from the sea spray! On route 4 heading north - about a 15-minute drive from Akko. It's also accessible by train. All year round. The summer is the time to enjoy the natural rock pools but the promenade is pleasant all year round. You can see the Arch Cave in Adamit Park situated at the highest point in Western Galilee. There's an amazing panoramic view from the park across the coastal plain and you can see the coastline from Haifa up into Lebanon. It's a good place for a picnic or you can buy Druze pitta and labane from one of the stalls in the park. The Arch Cave is also called the Keshet Cave because "keshet" is Hebrew for arch. It's actually the remains of a cave whose roof collapsed thousands of years ago leaving an impressive stone arch through which you can see the trees and countryside way down below. If you're into extreme sports, some "crazy" people rapel off the arch hanging in mid-air - I prefer to admire the view through the arch from the safety of the metal fence - but then, that's me! Take route 70 from Kabri junction or the 899 from Batzet junction in the direction of Shlomi. From there continue eastwards on the 899 and look out for the sign for route 8993 to the left to Kibbutz Adamit. Keshet cave is situated in Adamit Park and you have to drive up a steep winding road to get there. All year round, but best to choose a clear day. Where? Take route 70 from Kabri junction or the 899 from Batzet junction in the direction of Shlomi. From there continue eastwards on the 899 until you see a sign to Park Goren on your right. When? All year round. In Spring, you can see a wide variety of flowers in bloom. In Summer, there's plenty of shade and the Kziv Stream has water all year round. Where? Heading north: Take route 4 north of Haifa in the direction of Akko and Nahariya. Just before the Akko junction, you will see a large shopping center on your right. Turn off into the shopping center and follow the signs to Ein Afek. Heading south: On route 4, take the left lane once you pass the Akko junction and turn left at the next set of traffic lights - follow the signs to Ein Afek. Have you signed up yet for our FREE monthly newsletter? Get free updates by subscribing to the RSS feed on the left! Or click on the Google, My Yahoo!, My MSN, or Bloglines button if you keep a personalised home page there. Follow their instructions.